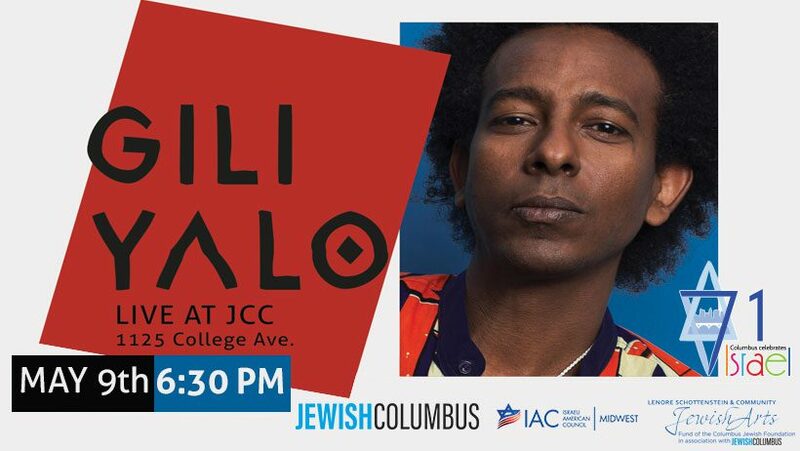 Join JewishColumbus, the JCC, Israeli American council Midwest chapter and Columbus Jewish Historical society for a community exhibition, Israeli dinner and performance by Israeli artist, Gili Yalo. Yalo is one of the most intriguing new musicians in the music scene in Israel. From his base in Tel Aviv, Gili Yalo combines Ethiopian roots with Soul, Funk, Psychedelic and Jazz music. Gili Yalo, has collaborated with top music producers Beno Hendler and Uri Kinrot (Boom Pam), incorporates sounds from traditional Ethiopian music into a contemporary music production. The result is an exceptional, rich, vivid melody accompanied by Gili’s unique voice with lyrics in both English and Amharic. Yalo’s band is made up of five musicians, including guitar, bass, keyboard, drums, and trumpet. An entrancing rhythmic motion is apparent when listening to Yalo’s music, from the groove, beat and flow, and up to the lyrics, concept and style of the project. During the event JewishColumbus will honor people in the community that made a great contribution to our community and to Israel including: Ayelet Ben-David and Tammy Mor, Ben Kanas, Brad Kastan, Chaya Aviva Katz, Cindy Leland, Emily Hindin, Evan Remer, Janet (Cookie) Eckels, Joanie Calem, Julie Ecker, Laurie Alexander and Rose Clubok.